While the Ordo Adeptorum Invisiblum was originally founded in England in 1979, their United States headquarters were established in Chicago in 1981. 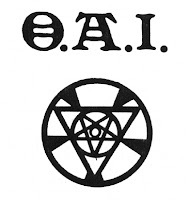 From what I can determine, the OAI practiced a form of feminist Thelema. The OAI also adopts feminist principles and practices—not the anti-male separatist variety—but in its non-sexist androgynous philosophy. Women are not the vehicle of a male seed, a male High Priest. They are magickal people in their own right. The history of female magickal energy is far older than that of the male, but it has been overshadowed by the masculine principle. The OAI seeks to rectify this by balancing the imbalance through women seeking to rediscover and reassert themselves, while male members minimize as far as possible their aggressiveness and dominance. In turn, this will lead to a more directly visible equality and non-hierarchical structure within the group and in rituals. The OAI teachings followed Aleister Crowley, Jack Parsons and an Ohio woman known as Nema, following a Maatian Current. and soror in favor of the single designation persona. year, one came to Chicago, where the first members of the OAI were received. rials possessed by the order. could be found in England, the Chicago metropolitan area, and California. While their history and manifesto is easily found online as a PDF, their many other writings are much more difficult to find. I've yet to find a listing for their Chicago headquarters, or any other information for that matter. As always, those with information are encouraged to make contact.